Grab three of your closest, craziest friends and come out to Old Ox on Saturday, March 24th for the Second Annual Donut Relay! The amazing Fractured Prune Doughnuts Leesburg is supplying the delicious pastry goodies for this years event! Teams of 4 people come together to eat and run. Each team must consume a dozen donuts between them. Each team must eat a total of 12 donuts and each member must eat at least one of those donuts. Other than that, the team can divvy up the eating duties as they see fit. All is fair in run and donut. Each person eats their share of donuts, runs two miles and heads back to the Donut Eating Exchange Zone. As soon as you hit the exchange zone – your next teammate can start slamming donuts. Each participant will get a beer, a rally towel to cheer their team on and wipe those donuts crumbs off their face, and of course, Fractured Prune Doughnuts! Two food trucks will be on site: Killer Tomato (12:30-9pm) Parallel Food Truck (12-5pm). As the relay finishes the party continues – we’ll have a band play from 1-4pm and an outdoor bar. 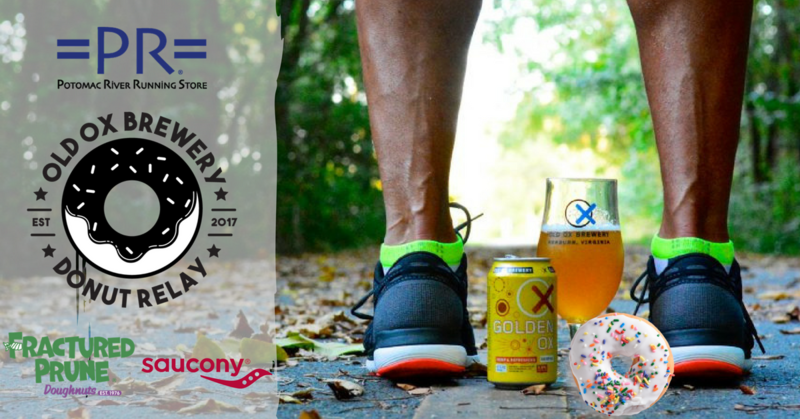 Saucony will be on hand displaying their latest shoes and we’ll have the entire lot behind Old Ox Brewery to relax, drink beers and digest donuts. We will start this event in waves with the teams expected to take longer starting earlier. We will start the first wave at 11:00 am and expect every team to be finished by 1:00 pm. Awards will be around 1:30 pm. Register to race here.